Interested to feature a promotion in Qoo10. Please Contact Us. Related FAQ - Following related FAQ will help you find the answer quickly. How to post the inquires to the seller? 1) Go to the item page on qoo10.com and click Question & Answer tap. Click [Ask Question] ▶ Item Q&A and then Qpost will be popped up. 2) Go to My Qoo10, find the item in the list and click cart no., and click Inquiry and Conversation. Depending on your issue, we'll help you contact the seller if necessary. Please give sellers two business days to respond. In most cases, you'll receive a reply much sooner. If you don't hear from the seller within two business days, kindly visit Help to solve the problem. 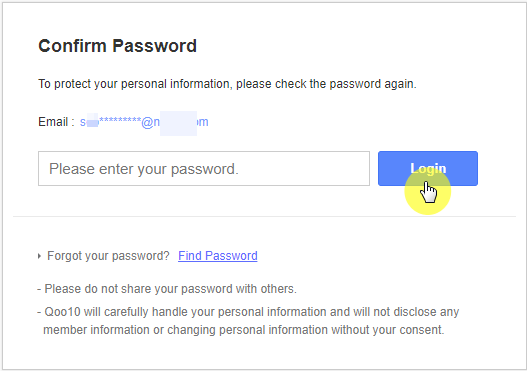 If you've forgotten your password, you can reset it by requesting that a personalized "password reset" link be sent to your e-mail address. After you've created a new password, it will become active right away. Please click here and follow the on-screen instructions to send the password reset link to your email. Don’t worry even if you don’t get mail, since you can change password by confirming account owner by mobile phone number. 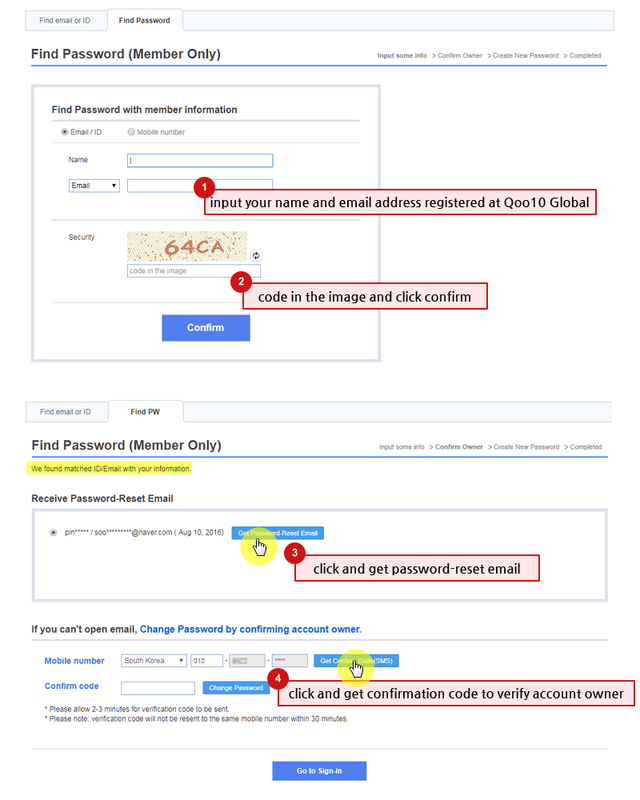 In order for you to change your account information, please sign in and click on ‘Personal info’ located at the My Qoo10 page. Please check your email and put the password again to confirm the safety. Please do not forget to click on ‘Save’ button lastly. Go to the order you want to track, whose status is "Shipping on delivery"
You can cancel the order immediately if the status is Shipping requested. If Shipping is scheduled, seller will check cancel request and notify you cancel or shipping. Click [Cancel] button under order status. After submitting the cancellation, we'll send you a confirmation message to Qpost and e-mail address on your account. You can also confirm that the order was cancelled by visiting My Qoo10. 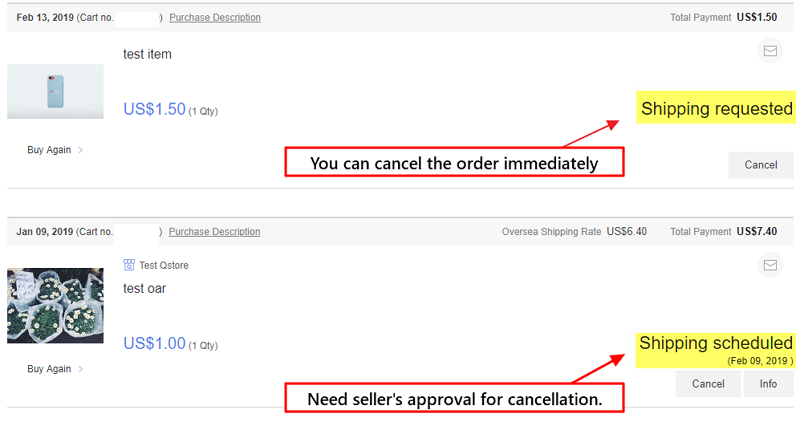 If you see the order in the Refunded section, it was successfully cancelled. If your order shipped directly from a seller and cannot be modified, you should wait the item to be delivered and request return to seller. For more information on how to contact the seller, go to Contact sellers directly.